Technology, Science & Alt Science / Re: Am I correct? An object of any mass (continuous) irrespective of size can be pushed or pulled without any resistance - Right? Wrong. You still have to overcome inertia which is the resistance to change in motion of a mass. as you said if i want to overcome inertia, i have to apply a force but aren't all the particles of mass falling towards their common point of the center of gravity which they make so where is inertia? Technology, Science & Alt Science / Am I correct? If this is true then shouldn’t the definition or the concept of inertia, which means resistance, needs revising. 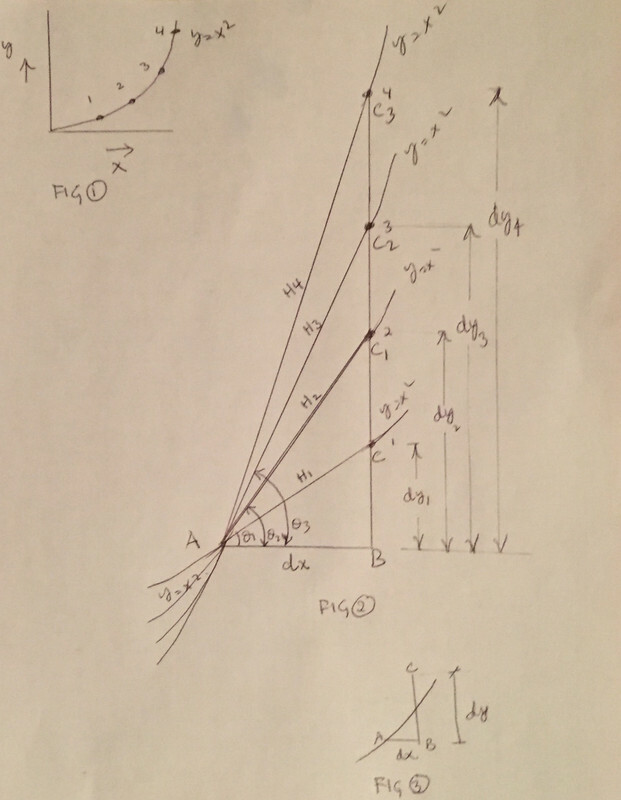 An object is said to be in a state of a well-balanced condition if its centroid or center of mass (c.o.m) locates itself at its spontaneous strategic position if left on its own accord. An undisturbed mass at rest is always in well-balanced condition. An object is said to be at rest if its c.o.m remain at its original position. An object is said to be in state of motion if its c.o.m off its original position. An object may spin about its undisturbed c.o.m in the direction of applied force when only a part of the mass is disturbed. A mass may spin and move if its c.o.m and a part of the mass are disturbed. Let A and B are two spherical objects of masses M and m at rest such that A > B and therefore M > m. Ca and Cb are the centre of masses of A and B respectively. Now, assume A is disturbed and moves with velocity V while B is undisturbed. Following is one the possible conditions when A collides with B. A pushes B in front of it in its original direction of momentum until both gains V1. Here B never offers any resistance to A rather it takes the momentum from A – total momentum of the system still remains the same. Let a and b are the jitters/impulses (shock waves) produced within A and B respectively due to their collision. Cb shifts away from its original position when “b” passes through it, which makes B unstable. Similarly, Ca also shifts towards its original position when “a” passes through it, which makes A less unstable than before. Although both A and B osculate (juxtaposed) each other but exert no further force on each other after when both masses attains V1. Both Ca and Cb off center, therefore, A is under reduced momentum of while B gained a momentum. A or B spins if the line action of a and b are truncated – not passes through the centroid. Push or pull is considered a force. Since A pushes B due to its momentum, therefore, momentum is a Force F.
So force which is push or pull depends upon on both moving mass and its final velocity, not acceleration. As said, it is the gravitating mass, due to which a falling mass shows resistance because of its weight against another force, therefore the heavier the mass the greater will be its gravity and resistance or the greater the mass the greater the force will be required to displace its c.o.m, therefore, a tiny apple can’t change the strategic position of c.o.m of earth. The collision effect of the aforementioned A and B depends upon the size, shape, density, and velocity, etc therefore both a and b may or may not reach the center of mass of A and B respectively. The two outer particles of A and B at tacnode, which collide with other, start exerting a force on the neighboring particles, the said neighboring particles pass a or b to the next connected particles closely and so on and this is how shock wave passes through A or B or M and m respectively. Both a and b depend upon the mass below, above, right, left, back and in front and how their elasticity or interlocking system, etc is. It is said that all objects fall at the same rate if this is true then why the damaging/penetrating effect of the same mass is different if fall (at the same rate) from different heights on the ground. Therefore Force F = MV but not F = ma or mg where g=GM/d^2 or 9.8 m/s/s. Similarly, addition or multiplication of two or more things of different types (e.g. goats and trees) has no useful meaning in mathematics unless totaling them, therefore, I don’t understand why mass and velocity (or mg) are in the multiplication form with each other in the formula of momentum. Why not momentum = M+V if the product of MV is allowed. And the same is applied to all similar mathematical equations. Is 3 (goats) x 5 (trees) = 15 goat-tree possible or meaningful? Anyway, shouldn’t force be measured relative to the displacement of c.o.m of moving mass as explained above and or indirectly via relative to standard penetration on the ground or any standard surface? Addendum: Neither an apple nor earth shows resistance when they feel the same amount of force pulling each other together. Similarly, if an object of any mass (continuous) irrespective of size can be pushed or pulled without any resistance then why the greater the mass the greater force required to move it? Shouldn’t the acceleration of an apple and earth be the same when they feel the same amount of force pulling each other together? Derivatives show us how fast something is changing at any point. For example; the gradient of the graph of y = x2 at any point is twice the value of x thereat. The process of finding the derivation of a gradient / slope of a function y=f(x) or y = x2 is as follow. • dy/dx is directly proportional to x or angle CAB is directly proportional to x. The proportionality of both the angle CAB and dy with x are in contradiction with the proportionality of dx and x in the triangle ABC after probing the equation of dy/dx = 2x beyond its derivation on a graph of y = x2. When x increases; dx decreases, dy increases, and angle CAB increases. This means AC also increases and ultimately SECANT when x increases. Our goal is to bring dx, dy and AC to zero (not away from zero either positively or negatively - Point C has to be on the curve) or secant to tangent by reducing them close to zero but here dx heads toward zero but dy and AC increases when x increases on axis. Although the difference in the length of dx and dy can be noticeable clearly on the graph if we examine the triangle ABC at two different points for a gradient (dy/dx), say when an angle BAC = 0.1 degrees and 89.9 degrees on the curve but UNIT CIRCLE is the best example for observing the change in an angle CAB (say 0.1 and 89.9 degrees) of a triangle ABC for dy and dx and the comparison of their lengths. RISE = dy = 2x and RUN = dx = 1 (always constant) in a GRADIENT of 1 in 2x which we obtained from the Eq1 of dy/dx=2x /1 at any point on the curve when there is no difference between secant and tangent – No idea how do we get dy/dx = 2x.dx but above said contradiction may be due to the introduction of another curve of y =(x+dx)2 at a point where we seize x or y=x2 deliberately and introduce delta x OR when function y = f(x) changed to y=f(x+Δx)2. The value of x has reached to its maximum value instead of unlimited when a curve y=x2 doesn’t continue anymore at a point where we introduce delta x or dx as y=x2 and y =(x+dx)2 are two different types of curve (two diffrent functions). Further, integration is the reverse process of differentiation. Although delta x or dx is ignored during the process of derivation of dy/dx becaue of their small values but we can’t ignore them in the process of integration which makes a lot of difference in summation. They can’t be disappeared forever and should resurface during the process of integration or summation. Similarly, dy is the small vertical change in y, therefore, we take the sum of all the small vertical lengths [dy(s)] not the whole slice or y-coordinate(s) from zero to its value on the curve when we integrate both sides of the equation of dy = 2xdx but it turns into function of x2 or area under the graph – no idea how but summation of vertical lengths on a graph gives vertical length only not curve? According to Eq1- dy/dx is directly proportional to x, dx is indirectly proportional to x and dy is directly proportional to x. UNIT CIRCLE is the best example for observing the change in an angle CAB (say 0.1 and 89.9 degrees) of a triangle ABC for dy and dx and their comparison. But on the other hand RISE = dy = 2x and RUN = dx = 1 (always constant) in a GRADIENT of 1 in 2x which we obtained from the Eq1 of dy/dx=2x /1 at any point on the curve when there is no difference between secant and tangent – No idea how do we get dy/dx = 2x.dx but contradiction may be due to the introduction of another curve of y =(x+dx)2 at a point where we diminish y=x2 deliberately and introduce delta x.
Curve y=x2 doesn’t continue anymore at a point where we introduce delta x or dx as y=x2 and y =(x+dx)2 are two different types curves no matter how small delta x is which is a portion of the length of known or fixed value of x. Further, integration is the reverse process of differentiation. Although delta x or dx is ignored during the process of derivation of dy/dx but we can’t ignore them in the process of integration which makes a lot of difference in summation. They can’t be disappeared forever and should resurface during the process of integration or summation. Similarly, dy is the small vertical change in y, therefore, we take the sum all the small vertical lengths [dy(s)] not the whole y-coordinate(s) from zero to its value on the curve when we integrate both sides of the equation of dy = 2xdx but it turns into function of x2 or area under the graph – no idea how but summation of vertical lengths on a graph gives vertical length only not curve? The derivation of the natural relationship of a gradient of 1 in 2x at any point with y=x2 or dy/dx=2x is still unbeknownst to illuminates - Anyone who is in agreement with all above. Let's analyze the equation of “dy/dx = 2x” in its algebraic form dimensionally. [ meter / meter ] = [ meter ] ------- is it correct dimensionally? This can also be shown in the diagram where dx is constant at 4 different points (1,2,3 and 4 in Fig1 and Fig2) if taken on the curve of y=x2 but then dy increases from dy1 to dy4 and angle CAB also increases from theta 1 to theta 4. As dx, dy and hypotenuse AC tend to zero after taking limits – But here if dx is constant then dy increases if the curve grows as dy4 > dy3 > dy2 > dy1 can be seen clearly in the Fig2 of diagram. This means the height of dy decreases when the length of dx decreases but increases when angle BAC increases – Is it possible simultaneously? Anyhow, since we don’t know the size of a point but for the sake of argument lets consider two adjacent point A and D of the curve of y=x2 as shown in the diagram. When x increases, D starts rolling up over A. Horizontal distance b/t the center of A and the center of D is dx while vertical is dy. AB (dx) decreases, BC (dy) increases when D rolls up over D or when the curve grows or x increases. Why is the curve "zero"? The length of the dx increases when the length of the AB increases and tends to zero or diminish when B approaches the point A which is on the curve. The same is applied to dy and hypotenuse of right-angled triangle ABC. The curve itself, not zero but point A on the curve is a reference point or start point if we measure AB which is equal to dx. No, I'm trying to explain that dx is not in any way dependent on x. The direction of the whole curve (y=x2) changes from the x-axis to a y-axis, therefore, the base of the triangle AB decreases when x increases if we look at the AC on the curve of y=x2 carefully at point 1, 2 3 and 4. The position of the immediate points above A at point 1, 2,3 and point 4 is not the same but slightly changes its position towards y-direction (rolls up on point A) as shown in the diagram when x increases. The center to center distance between two adjacent points (say dx) is not the same in all cases but decreasing. The perpendicular, dy increases when the base, dx decreases even at point level (rolling of a dark point on a lower white one). The diagram is not accurate or to the scale but for the understanding purpose only. The position of dy is shown in Fig3 if we shrink dx in Fig2 further to A or zero which we can obviously. As told our goal is to bring dx, dy and AC to zero not taking them away from zero either positively or negatively. Yes, you are right according to the concept of dimensional analysis but then dy =2xdx is also a curve instead of straight line. I'm not 100% certain what you mean. Are you saying that the segment dy would be a curve? Why? It's just a straight line with length equal to 2xdx. - Yes, because you said in the following quote. Because y is equal to x squared. Even in the form dy=2xdx you can see that dy is in the form of something with x times something with x. If x represented meters, dy would be measured in square meters. Adding up square meters gives you square meters, no? EDITED: I had already pointed out (don’t remember when and which forum) that delta y [or delta y=2x. delta x] is a curve because of the multiplication of x with delta x or x but I was told it is not due to the subtraction of coordinates. The reason behind it might be the two different types curves of y=x2 and y =(x+dx)2 as asked earlier. Our goal is to bring dy, dx and the hypotenuse of right-angled triangle ABC to zero (on the curve) not away from zero either positively or negatively. So when x increases - dx approaches to zero but decrease - right, not constant or increases. If this happens then both BC and AC decrease due to the reduction in dx further in the equation of dy = 2xdx. Now if the angle BAC or CAB increases (say to 89.9 degrees), dy also increases (going away from zero) in order to maintain the three sides of right-angled triangle ABC. Thus the height of dy decreases when dx decreases but increases when angle BAC increases – Is it possible simultaneously? Hence, there is an issue with the adjustment of dy in the right-angled triangle ABC when x increases. If the length of dx is constant and tends to zero then the size of the tiny triangle ABC increases when the value of x increase on axis as BC=dy = 2xdx or slope=dy/dx=2x. As dy = 2xdx therefore when x=4 on axis, then dy = 8dx. Since dx tends to zero therefore the infinitesimal value of dy at x=4 will be 8 multiplied by dx. This is the LINEAR length of dy which is the perpendicular=BC of tiny triangle ABC not the y coordinate at x=4 on axis. How come the summation of the LINEAR length of all these tiny perpendiculars turns into x2 (second-degree curve) in the process of integration? – This is my question or confusion. Integration: As dy = 2xdx therefore we get y=x2 if we integrate both sides of the equation of dy = 2xdx. Again I don’t see any relationship of y = x2 with the summing of the length of all dy(s). The integral of 2 is 2x +c --- no idea how? Great - when x increases then this means BC and AC also increase and ultimately the size of the whole tiny triangle ABC for each point as we go along the curve. let's determine the slope at point 1 and point 4. Triangle ABC taken at point 1 will be smaller than triangle at the point 4. AC and BC of a triangle taken at point 4 are greater than AC and BC of a triangle taken at point 1. This means we have more points on AC of the triangle taken at point 4 as compared to AC of the triangle taken at point 1 if point C of both the triangle (taken at point 1 and point 4) on (or approaches) the curve. This means AC of the tiny triangle or secant increases when x increase instead of turning into a tangent at a point where the slope of the curve is to be determined. How do you adjust the length of dy=BC = 2x.dx of the tiny triangle ABC so that point C remains (or approaches) on curve of y = x2 when x increases if dx is not the same (or say same) for all dy(s)? What do you mean "if dx is not the same (or say same) for all dy(s)"? What does that mean? The length of dy is 2xdx+dx^2. Dy/dx is 2x+dx. The limit of that as dx tends to 0 is the derivative, which is 2x. Usually when we use dy and dx it is implied that we've already taken the limit, and we're talking about infinitesimal quantities. So we might as well say that for these infinitesimal quantities, dy=2xdx. What that tells you is that as dx gets smaller and smaller, the length of dy tends to become equal to 2xdx. Where the your issue? I asked because there is an isssue of the adjustment of dy with dx in the tiny triangle of ABC if x increases. As you said the length of dy tends to become equal to 2xdx. Doesn't the length of dy increase when the value of x increases in the equation 2xdx as explained earlier if dx is constant. Hence the size of the tiny triangle ABC also increases when x and dy increase simultaneously. You can also see the different lengths of dy1, dy2, dy3, and dy4 and their respective tiny triangles for points 1, 2,3 and 4 in the diagram. How do you adjust the length of dy=BC = 2x.dx of the tiny triablge ABC so that point C remains (or approaches) on curve of y = x2 when x increases if dx is not the same (or say same) for all dy(s)? Doesn't point C of dy=BC = 2x.dx out of a curve of y=x2 as shown Fig 3 if x increases whether dx is the same or not for all dy(s) ? No, dx cannot be the same for dy1, dy2, dy3. I don't have the time to draw a diagram with these on it right now. so it means you are ok with 1, 2 and 3 as explained earlier when x increases. This means the length of the tiny perpendicular of dy of a very infinitesimally small right-angled triangle = 2x multiplied by the tiny base of dx + dx2. Although dx and dx2 are very small but their summation makes a lot of difference in integration, therefore, should we ignore dx or dx2 in integration which is the reverse process of differentiation? Similarly, how come we get y = 2x2/2 = x2after integrating both sides of Eq2 when we are taking the sum of all the tiny perpendicular dy(s) at various points on the curve but it turns into an area of a graph? - we are not integrating the Y-Coordinates but the tiny perpendicular dy(s). Can dx be the same for dy1, dy2, dy3….........dyn if we reduce it to zero as shown in the diagram, not the scale? Now when x increases in the equation of dy = 2xdx [dy/dx= 2x], then all of the following also increase due to the trigonometric reasons if we keep the value of dx constant I mean not zero but almost zero, close to zero or limiting it to zero. 1- The length of the hypotenuse also increases. This means we have more points on hypotenuse when both x and dy increase simultaneously. Now if we zoom point A further then dx can be reduced to zero further for smaller slopes but not for larger slopes due to the increase in the length of dy(s) if we start decreasing the value of x. This is why dx also increases when x increases due to the minimum limit from zero towards infinity set by trigonometry. 2- Point C of the tiny triangle doesn’t coincide with curve due to its increased length as dy = 2x.dx but crosses the curve as shown in Fig 3 if dx is constant for all the dy(s) or even reduce to zero further. This of course does not make any sense. You can't divide 0 by 0. But remember, we're trying to compute a limit, not substitute dx for 0. We want to know what number this function tends to as dx approaches 0, but without actually taking it to 0. Their difference is 2xdx+dx^2. That's the change of y for a change dx, and we call it dy for that reason (the delta of something is usually the change in something). If I walk dx steps to the right, I will have to take 2xdx+dx^2 steps up to get to follow the function. The slope I walked up to is then clearly dy/dx=2x+dx. The derivative is simply the limit as dx tends to 0, and it corresponds to determining the slope for an infinitesimally small step, to determine the slope at the particular point you are on. Agreed but the angle of the hypotenuse/slope of the two similar right-angled triangles is the same no matter if the ratio of the rise to run is infinitesimally small (dy/dx) where dx not equal to zero but tends to zero say 1/infinity or bigger (x/y). We multiply the height by the width for each slice, and then we add them all together. Here is the confusion - the original equation is dy/dx = [2xdx+dx^2]/dx. After simplification and taking limit, it reduces to dy/dx = 2x where dx tends to zero. Now dy = 2xdx after rearranging. This means the length of the tiny perpendicular dy of a very infinitesimally small right-angled triangle = 2x multiplied by the tiny base dx. We are integrating all the tiny perpendicular dy(s) if we integrate both sides, not the full heights (y-coordinates) with tiny width dx of the slices- I don't see any rectangle of height y with tiny width dx? Similarly, if dx tends to zero in differentiation then it tends to infinity in integration but we ignore dx or dx^2 in integration which makes a lot of difference. it is said there is no difference b/t secant and tangent in limiting secant to the tangent but actually it does depend upon the location of picking two very small positive numbers on the aforementioned curve. The angle of the slope of a tangent increases when x increases and vice versa as dy =2xdx. This means secant never turns into tangent when x increases and hence we can’t approach to zero fully as we thought due to restriction of minimum limit (length of dy=2xdx) set by the trigonometry (base and perpendicular of right angle triangle increases or decrease with certain ratio). I'm not sure what you're referring to and why it's relevant, can you post a link to where you saw that so I can understand what you're saying a bit better? Sorry, I should have written IMPOV - there is a huge difference in taking dy/dx at P and P1 as shown in the diagram. The length of the tiny perpendicular dy increases when x increases as dy = 2xdx, therefore, dy at P and P1 are not the same and hence their dx are also not the same. This means the length of the dx taken at P1 must be greater than the dx taken at P and this why dx at P1 doesn't approach to zero fully due to the restriction set by trigonometry. Similarly, as said y=x2 and y =(x+dx)2 two different types curves no matter how small delta x is, say 1/infinity which is a portion of the distance of known value of x, therefore, I don't understand why the Y-Coordinate of second point Q (close P) is taken as (x+dx)2 on the curve of y=x2. Since value of x doesn't stop but continue at a point where dx started in the general derivation of dy/dx, therefore, we can't introduce another curve of y =(x+dx)2 in the middle of a continuous curve of y=x2. if we introduce dx at a point where x stops then it means we are started graphing another curve of y =(x+dx)2 at a point where x stopped and therefore it's not a curve of y=x2 anymore beyond the point where the valuve of x is stopped or where dx started. When we "shrink" dx to 0 we take its limit, we don't substitute dx for 0. The limit of 2x+dx as dx approaches 0 is 2x. What does that mean? Saying that a number is the limit of a function as x approaches to x0 means that you can get as close to that number as you want by approaching x0. As asked, we introduce delta x or dx right at the start in order to derive the equation of slope dy/dx at any point on the curve but we ignore delta x or dx just before the derivation of dy/dx – it does not make sense to me? Further, delta x or dx is ignored during the process of derivation of dy/dx but can it be ignored in the process of integration which makes a lot of difference in summation? The formal definition involves picking two very small positive numbers, ε and δ. The limit of f(x) as x approaches x0 is a number for which you can pick ε and δ to be as small as you like, and you will still be able to find an x whose distance to x0 is smaller than δ so that the distance of f(x) to that limit will be less than ε. This can easily be observed if we take two positive numbers at a larger value of x where the angle of the slope of tangent is greater. Also, aren’t both y=x2 and y =(x+dx)2 two different types curves no matter how small delta x is which is a portion of the distance of known value of x if yes then why we are taking the y-coordinate as (x+dx)2 of the second point chosen close to the first point?. The vertical change between two points is called the RISE while the horizontal change is called the RUN. Hence slope is the ratio of the vertical and horizontal changes between two points on a surface or a line. So no slope when there is no rise and run at any given point. We all know how to draw a graph of y = f(x)=x2 curve. Take two points P and Q close to each other on y = f(x)=x2 curve. The coordinates of P on the curve of y = f(x)=x2 are (x, y) or (x, x2). Since it is said x changes from x to (x +dx) where dx is the symbol we use for a small change, or small increment in x while y changes from f(x) to (x+dx)2. The corresponding small change in y is written as dy. Thus the x and y coordinates of Q are (x + dx, y + dy). When dx is shrunk to zero then it is disappeared on RHS but it's not on LHS – no idea why? Similarly, when dx heads towards zero then the coordinates of Q are also becoming equal to the coordinates of P but they are not. Moreover, we introduce delta x or dx right at the start in order to derive the equation of slope dy/dx at any point on the curve but we ignore delta x or dx just before the derivation of dy/dx – Does it make sense? Anyhow, this means, RISE = dy =2x while RUN = dx = 1 but is it possible for x to be present in such small change in y or dy and 1 in small change in x or dx? Further, integration is the reverse process of differentiation. Although delta x or dx is ignored during the process of derivation of dy/dx but can it be ignored in the process of integration which makes a lot of difference in summation? Aren’t both y=x2 and y =(x+dx)2 two different types curves no matter how small delta x is which is a portion of the distance of known value of x. Since we don’t know the limit of the distance of the x, therefore, can we fit delta x within the distance of x? Both y=x2 and y =(x+dx)2 works fine for all numerical values in which we set the limit of x but since we don’t know the maximum limit of x, therefore, isn’t it wrong to say y=f(x)=x2=(x+dx)2? Aren’t we actually started graphing another equation of y=(x+dx)2 (unbeknownst) instead of y=x2 after point P by choosing another point Q at a distance of delta x from P on the curve of y=f(x)=x2 in which the maximum limit of x is unknown? We can see the difference if we start graphing both y=(x+dx)2 and y=x2 right from the origin at the same time. Flat Earth General / Re: Does time dilate during nighttime when the earth orbits the sun? 1. Is the outer midnight circle as represented or traced out by (x0,x1,x2,...) larger in circumference than the inner circle as represented or traced out by (y0, y1, y2,...)? 2. If yes to question 1. Would there be more midnights than noons because the Circumference of outer circle > Circumference of inner circle and hence the # of Midnights > # of Middays? Therefore orbital GRAG of Midnight is more than the orbital DRAG of Midday in order to make the occurrence of Midnight = occurrence of Middays. Technically, shadow growth on earth is either stopped or very very slow during this drag w/o spin. Would this DRAG w/o spin affect SEASONS or Calender due to the change in the position of the earth in its orbit as asked earlier? Fig #1: when the earth rotates on its axis but has zero orbital motion. Noon and Midnight are happening in this case INSTANTLY. The earth spins on its axis at the speed of 30 m/sec. The travelling speed of earth is 30,000 m/sec in its orbit. I think you didn't follow the post properly - As mentioned earlier the speed of the earth's spin is 30 m/sec and earth's traveling speed is 30,000 m/sec in its orbit. Midnights are touching the outer circle. Middays are touching the inner circle - Right? So you agree Midnight is traveling in the orbital circumference for a while (as you quoted) not just touching the outer circle instantly but not Midday - Right? By equating Arc I and Arc II you are referring to their measure or extent (Length). Each point has no measure so no quantity of points will give you measure. Each point is an instant in both position and time and has no duration. Each point is undergoing a continuous change in time and position. To me it’s like asking how many apples equal an orange? 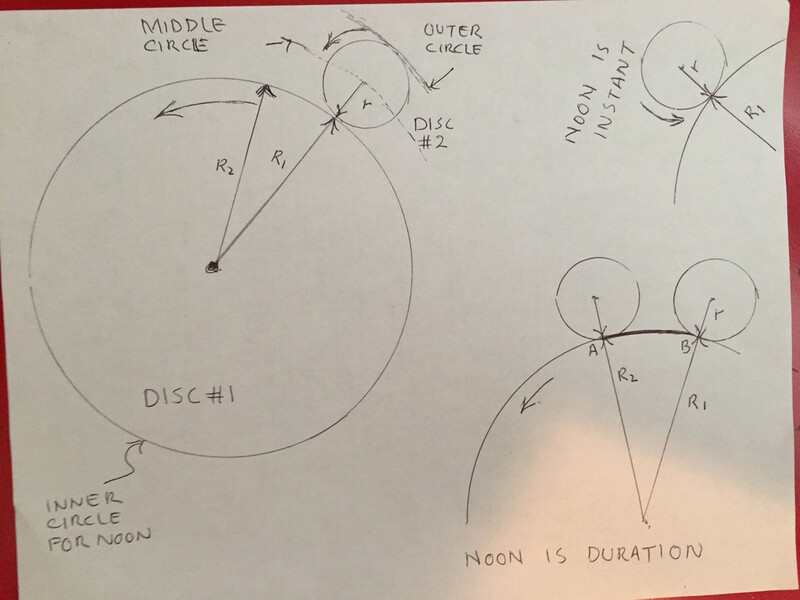 "The occurrence of Midnights (Anti-Noons) on outer circles are more than the Middays (Noons) on inner circle"
Because Arc I is at a greater radius than Arc II and circumference 2 x pi x radius. There is a Midnight for every Noon if both Noon and Midnight are instant - Right. Therefore, shouldn't Arc I = Arc II if both Midnight and Midday are instant and equal in numbers but Arc I > Arc II - Any special reasons??? Epitrochoid/ Generator is just humanly manipulated web application - It can miss many things including what I am talking about. Do you agree midnight (Arc I in the diagram) is a "DURATION" due to its longer path in space and greater velocity in the earth's orbit for any instant noon in/on Arc II if not then why there is a drag of midnight OR Arc I > Arc II? I think here is the confusion (may be wrong): You consider the earth's drag w/o spin on outer circle due to its greater velocity but ignore earth is also dragged on an inner circle due to its velocity (not zero) though less as compared to on outer circle. I'm novice in astronomy. It's not about the challenge but it's all about positive discussion and IMPOV. I may be wrong unless someone agrees. Figure on the Top Right:) - NOON is an INSTANT when the stationary earth (zero orbital speed) rotates around its axis. "When there is an instant noon, there is an instant midnight as well"
Disc #1: It rotates about its own center which is the center of the sun. The rotation speed of this disc at R=R1=R2... is equivalent to the orbital speed of the outer surface of the earth at the equator (noons on inner circle). Disc#2 rests on Disc#1 as shown. Noon is a "DURATION" between B and A when an earth doesn't have a chance to spin around its axis while simply moves/ drags fast forwards in its orbit. ---:)) Even if a noon is an instant, midnight should also be an instant not multiples midnights for single/instant noon - Isn't midnight a "DURATION" due to its longer path for instant noon according to you in the previous discussion. The most simplified form of "Instant Noon" is when the earth spins around its axis and is stationary (it doesn't revolve around the sun (i.e orbital speed is zero) - instant Noon occurs when the orbital speed < speed of axial rotation of the earth or equal to zero. Draw a radius r of earth at any Noon. Let R1 is the radius of the inner circle in the diagram. Both r and R1 are in a straight line at any noon. Since the orbital speed of earth > its axial rotation speed, therefore, the line r of earth transfers to another R2 but =R1 on the inner circle without axial spin (Earth doesn't have a chance to spin at that point due to the greater orbital speed). Now r is in a straight line with R2 not R1. 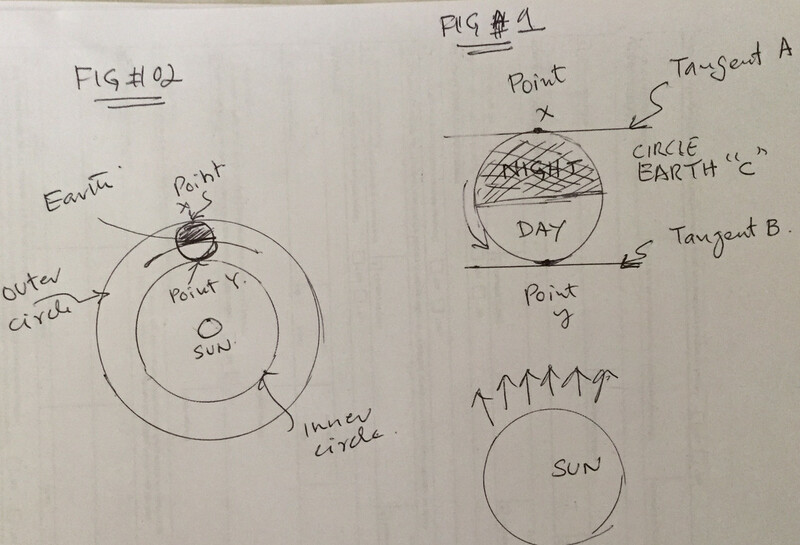 So the earth simply moves forward in its orbit on the inner circle b/w R1 and R2 but w/o spin. This means Noon is a DURATION not Instant if it drags forward in its orbit w/o any spin. it happens when the orbital velocity of earth is greater than the speed of its axial rotation. Instant Noon occurs when orbital velocity = or < axial speed. Shadows growth doesn’t stop in instant noon. Duration Noon occurs when orbital speed > axial speed. Noon point is dragged forward in the orbit but on the constant orbital radius (on the inner circle) for some DURATION before it spun again to afternoon due to the greater orbital velocity. Shadow growth is stopped when the sun is overhead during this "constant noon". Would the position of earth change in its orbit for seasons due to aforementioned "Duration Noon" (when the earth (or each noon) is dragged and forward in orbit)? Imagine the said diagram (3 circles) is a circular disc. The center of this disc is the center of the sun. The disc is rotating about its center such that the rotating speed of middle circle on a disc is equivalent to an orbital speed of earth. Now imagine both the bigger disc (for orbital speed) and smaller disc (for axial speed) at the same time – would you be able to find “duration noon” now? Can you calculate aforesaid DURATION on the inner and outer circles? Would the said DURATION affect sidereal and solar time/seasons etc? Since shadow of any vertical pole would not grow during noon (DURATION) therefore would we be able to notice or measure such DURATION on earth? Any point on the outer circle, which represents midnight if connected to the center of the sun via a straight line passes through the noon (inner circle). When there is midnight, there is a noon, therefore, total duration/occurrence of midnights must be equivalent to the total duration/occurrence of noons and hence their lengths. We can't have multiples noons for one midnight at particular instant due to the combined effect of axial and orbital motion of the earth.